Twas the lunchtime before Bonfire Night, necessitating a stop-off at the Firework Emporium: Andy to lay down four bullseyes for his village, me to drop two ayrtons for smaller scale celebrations at Broom Acres. Nose duly gunpowdered, down Foxhall Road a tad further and right into Wellesley Road. 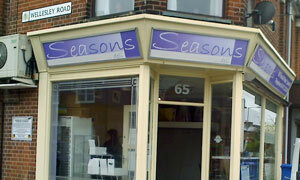 Sprung into Seasons Deli, right there on the corner. Four window seats is all -- enough to satisfy the seminal Take A Pew light lunch guideline -- half of 'em occupied, but mother & daughter are now leaving, not on our account. As would be obvious from the next 40 minutes, trade here is nearly but not quite all takeaway. Lengthy list of baguette and bap options, plus paninis. Oh, the choice. Pick one, any one. Ok, a chorizo & chutney baguette, ta very much. Slice / spread / fill, there we are. What, you're eating in? Lady grabs it back and swiftly re-presents it on a large white plate, no salad required. Ditto the lack of piped Vivaldi music. Multifarious are the boxes of crisps on offer. Anything different here? Oh yes, a bag of tomato flavour Snaps, still with that dragon on the front. Result. Cherry coke on the side, no glass, though could have had a Ben Shaw (like Wickham chippy). Downside of all that savoury choice is the tendency to Piaf: chorizo, like the view, is nothing to write home about, but should I have had the coronation chicken? Spotted, a coffee machine towards the rear. Latte, please, and one of these tempting white choc topped muffins. Satisfying combination, and straight on a plate this time around. With only crumbs remaining, time to divvy up the rockets and jet off home. If it was a car -- SMZ S3A. If they were passing by -- Alan Alda.